Five brass players from Woodley Concert Band and Trinity Concert Band recently came together for some engagements and decided to form a new quintet. The group comprises two trumpets, two trombones and a tuba, an unusual combination that works well. 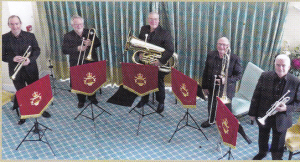 Using the instruments' initials, they settled on 5Ts Brass as the group's name. Three members of the ensemble were professional musicians with the army, but all the members are now retired which allows engagements during the day as well as evenings. They play arrangements of light classical pieces, folk songs, popular pieces and original compositions for brass ensemble. The members of the quintet are: John Sayer - Trumpet, Phil Graham — Trumpet. Stephen Kerry — Alto Trombone, Dave Robson — Tenor Trombone and Len Tyler — Tuba.